We offer various study modules, lectures, seminars and practice courses to different level of studies in the field of micro- and nanometer scale characterization of materials by means of electrons, X-rays, and scanning probes. Hosting state-of-the-art facilities, teaching activities in our institute places an emphasize to electron microscopy: from the very fundamental background to frontiers of the field; from methodological development to application to a wide spectrum of materials studies. Since the winter semester 2016/17, we started to offer major field of study (Kernfach) and side field of study (Nebenfach) to Master students in Materials Science (WMT) and Nanotechnology (NT). 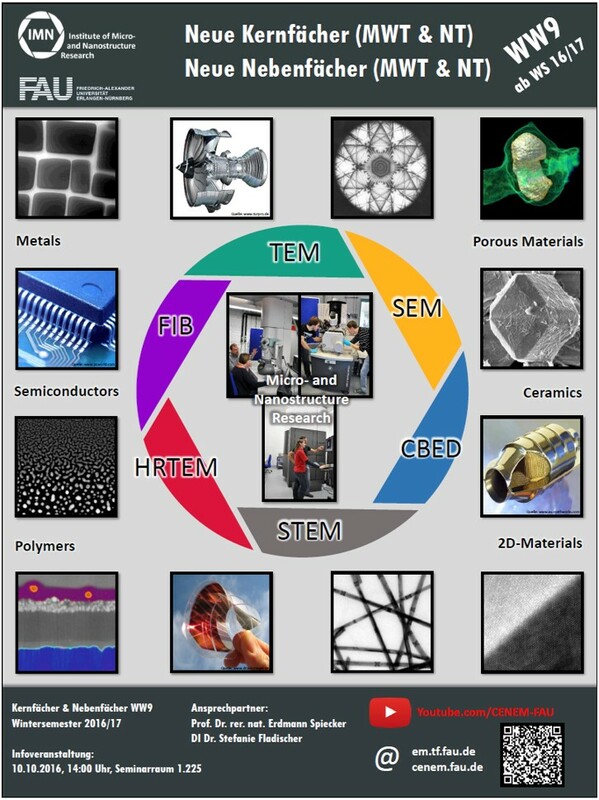 Besides, we also offer lectures in this field to students in the Elite Master’s Program “Advanced Materials and Processes” (MAP). Students who choose us in the major field of study (Kernfach) will can have hands-on training and experiences with one of the world’s best electron microscope in practice courses. For more details on the arrangements of the lectures, modules, seminars and practice courses, please click below in the different level of studies. The teaching arrangements (lecture times, rooms and lecturer(s)) are to be found in UniVIS.